Anyone who has used Skrill before can agree that it is one of the fastest online payment methods available on the market right now. If you’re a fan of online transactions, but you’re reticent to share your card details, Skrill is the best solution for you. And that’s not all; it gets even better than that! Besides being a top payment method, Skrill is also one of the most-used payment and withdrawal options at various online betting sites. In this article, you will get the best Skrill betting sites as well as all the special promotions attached to this payment method. Also, for those who are not familiar with how Skrill works, there’s a complete guide below with all the information you need to get started. The fact that Skrill optimises its services for various betting sites is indisputable from the moment you deposit funds to your e-wallet account. You’re being asked to check a box if the funds will be used for gambling purposes or not. That right there is the moment you know you found an excellent payment method, which is personalising the processes depending on your personal needs. However, since there are a lot of different betting sites out there, we want you to be able to find the best one for you. That’s why we’re putting on display the best three betting sites in the UK that accept Skrill as both deposit and withdrawal options. So, without further ado, let’s jump straight into these internationally renowned UK bookmakers where you can use Skrill. Not only is William Hill one of the most prominent betting sites in the UK, but its great reputation also extends globally. When a betting site of this size recommends Skrill as one of the best payment methods, you know you’re dealing with a high-quality product. Using Skrill at William Hill is an excellent idea because it will make the entire betting process a lot faster and easier. There are no fees that you must worry about when you pay with Skrill, but that’s the case with all deposit methods at William Hill. The most significant advantage of using Skrill over any other payment methods comes from the processing speed of withdrawals. The money is transferred instantly in and out of your betting account, and that’s a massive advantage for a punter. Besides speed, Skrill makes depositing a piece of cake since you’ll only need to insert your email address and password and you’re good to go. Faster depositing means that you will be able to bet on your favourite games for a better overall betting experience. There’s only one category of punters that might disagree with the fact that Skrill is one of the best payment methods William Hill offers – the ones that love playing with bonuses. Unfortunately for them, William Hill does not provide the Welcome Bonus for the first deposit with Skrill or any other e-wallet for that matter. In this case, you might want to look for an alternative that will allow you to enjoy bonuses. Another top-rated betting site in the UK as well as worldwide, 888Sport keeps Skrill high in their deposit and withdrawal options. Having a wide diversity when it comes to payment methods, 888Sport’s customers that choose Skrill will be able to deposit instantly, any amount between £10 and £10,000 and withdraw just as quick. Compared to other withdrawal methods, when withdrawing your funds through Skrill, you won’t have to pay any fee for the processing of the transfer. A Wire Transfer, for example, might cost you up to £40, while Skrill is free and instant. The speed of the payments will allow you to enjoy 888Sport’s exclusive range of in-play bets - another way to make betting even more exciting through 888Sport and Skrill. With a dominant presence in both the online and offline environments, Paddy Power is a great betting site that primarily focuses on the UK market. Skrill has its headquarters in London, so it makes perfect sense that these two companies work together to offer punters a complete experience. At Paddy Power, you can use Skrill to top-up your account and place bets on a vast variety of sports with just as many betting markets available. No matter if you play from a computer or a mobile device, Paddy Power will provide you with everything needed for a fascinating betting session. It’s worth knowing that you can use Skrill as both deposit and withdrawal method at Paddy Power. Furthermore, if you choose to cash out your funds through Skrill, your withdrawal will be processed instantly, with no fees whatsoever. The speed and security provided by Skrill, combined with the ease of use, as well as the lack of taxes, make it one of the best payment methods Paddy Power has to offer. You might already have an idea about what the benefits of using Skrill at betting sites are. From the particular cases of the three sportsbooks presented above, you can see that Skrill is fast, secure and you won’t have to worry about fees applied by the betting sites. However, there’s much more about Skrill than just this, and this section will provide a full list of advantages that make Skrill a very efficient payment method. Punters in the UK as well as all over the world agree that betting became a lot easier since they started using Skrill for topping up their accounts, as well as cashing out the winnings. Transferring the funds back to your debit card or even to another e-wallet is a straightforward process and that’s another huge advantage for Skrill. In a world full of regulations and restrictions when it comes to money transfers, Skrill makes it all look easy. Next, we’re going to take a closer look at these Skrill advantages and see exactly how they benefit you when it comes to using it as a payment method for betting sites. Stay tuned to learn why exactly Skrill is the best option for depositing at betting sites. Punters, especially the ones from the UK, are all about speed. The time spent between the moment they decide on a bet and the moment they place the bet is crucial. The betting scene is a very dynamic one, even a minute of delay might lead to a lower odd. It can mean fewer winnings, and nobody wants that to happen due to a payment delay. When you deposit with Skrill, you won’t need any complicated usernames, passwords or activation codes. Your email address associated with the Skrill account and your password is all you need. Log into your account at the betting site, enter the amount, fill in the email and password and you’re good to go. The process of depositing at the betting sites is fast and effortless, however, that doesn’t mean that they overlook security at Skrill. They guard each with the latest online security technology, and Skrill has a dedicated anti-fraud team continually monitoring activity to prevent any form of data theft or unauthorised access. From a betting perspective, the security Skrill brings is highly appreciated by punters. By using Skrill, they won’t have to disclose their credit card information to the betting site directly, and that adds an extra layer of protection. This means that even the most security-concerned punters can relax and enjoy their bets. When using Skrill, there’s no such thing as wasted time. Making a deposit takes a few seconds, so you can taste the betting action to the fullest. The same applies to withdrawals made with Skrill. Indeed, each betting site has an agreed processing time, however, after they process the withdrawal, you get the money instantly in your Skrill account. From there you can choose to put it back on your credit card, bank account or, use the following advantage that Skrill brings. After you receive the funds from a withdrawal, there’s no need to transfer the funds back to your bank account. Since the banks are involved, the process can take up to 3 business days. Use your funds instantly with the Skrill Pre-Paid MasterCard that you can use at almost any bank in the world. Withdraw money directly from the ATM with the Skrill MasterCard that’s directly attached to your Skrill account. You can request the card directly from your account and you receive it via mail within a week. We’ve all seen the big list of advantages that Skrill has over other payment methods. Even so, there is no such thing as a perfect payment method. It might come as a shock for some punters, however, even Skrill is flawed. Don’t worry about it, it’s nothing too serious, however this is a thorough and honest review of Skrill as a payment method for betting sites. So, we include every aspect related to Skrill, be it positive or negative. One of the most obvious disadvantages that punters face when using Skrill to deposit at betting sites comes from not being eligible for New Customer offers. Most of UK sportsbooks choose not to offer bonuses for those punters that deposit through e-wallets. Any payment method, no matter how good it is, can’t cover all countries of the globe with its services. The same goes for Skrill that has quite an extensive list of countries where it doesn’t provide their services. To deliver top-notch security features, Skrill has to make specific verifications before you can fully use your account. However, there are quite a few customers that complain about the entire process and consider it to be too long. First of all, to add a new account or debit card, you will need to verify it through what can prove to be a complicated process. Skrill credits a random amount from your account and, to check that account you will need to provide the exact value in your Skrill account. Since it can take up to 2 business days to get the precise amount, you can imagine how frustrating this can be. Other verification procedures include sending a copy of your ID, a selfie or even the credit card you used to top-up your account. These are standard KYC procedures that any e-wallet will ask from their customers but are considered too much by some users. Every ewallet or payment service will have certain fees since that’s the only way they can exist and offer their services. There’s no such thing as a free payment method, but that doesn’t mean financial assistance should have hidden fees. Skrill is usually upfront with all its depositing fees such as the 1.9% if you choose to upload funds via credit card or the 7.5% if you choose Paysafe. However, we can’t say the same thing about the currency exchange fees. While they do not display any fee, the exchange rate is often higher than what other financial service providers charge. We’ve already seen why Skrill is preferred by most punters when it comes to topping up their balance at various betting sites. Besides its increased speed and security, Skrill is perfectly adapted for mobile use thanks to its Skrill 1-Tap version. 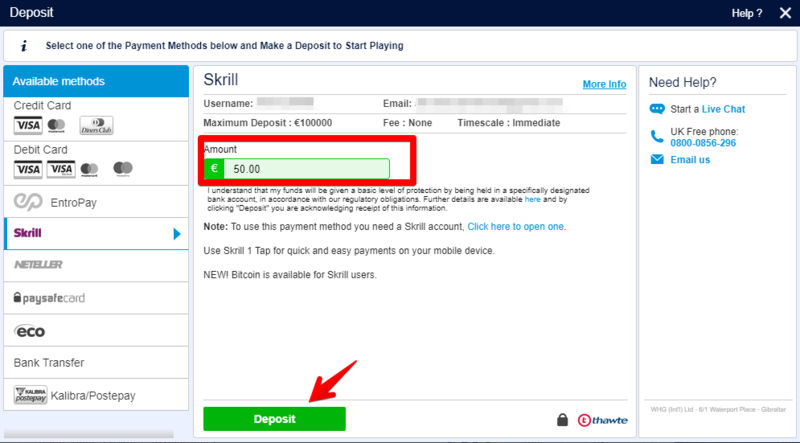 If you’re about to make your first Skrill deposit at a betting site and you’re not sure how to start, check out the detailed step by step instructions below. Log into Your Sportsbook Account. After you are logged in, click on the ‘Deposit’ button in the upper-right corner. Now, enter the amount you wish to deposit and click the green ‘Deposit’ button. 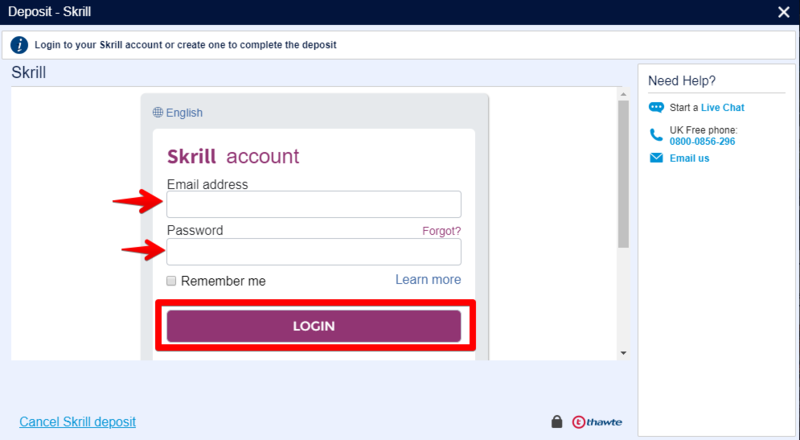 If the amount you want to deposit is already available in your Skrill balance, you will see the balance of your Skrill account. If not, you will be asked to enter the CVV of the card linked your Skrill Account. The funds will be taken directly from the credit or debit card attached to the Skrill account. After you click Pay Now, if the amount you are trying to deposit is available on your Skrill account or the card attached to it, the transfer will be successful, and you will be ready to place your bets. As you might already know, Skrill is an e-wallet designed to allow you to make safe and fast purchases online. You can use it both from a computer and a mobile device to send and receive money, as well as depositing on most, if not all betting sites. However, before we jump into any more details, let’s find out how you can create a Skrill account. We put together another step-by-step guide for the entire process. Access Skrill’s website and click on the ‘Register’’ button on the homepage. On the next screen, you will be asked to provide some details about yourself. Make sure to provide accurate information as they verify this at a later time. After completing these fields, click ‘Next’. Next up, you are requested for some more details regarding your Address to move on to the next step. Once again, please provide accurate info as written in your ID and then click ‘Next’. The fourth and final step is choosing your preferred currency and deciding whether you want to receive emails from them. Simply press ‘Open Account’ afterwards. That’s it! You are now ready to access your Skrill account, verify it and start placing bets. 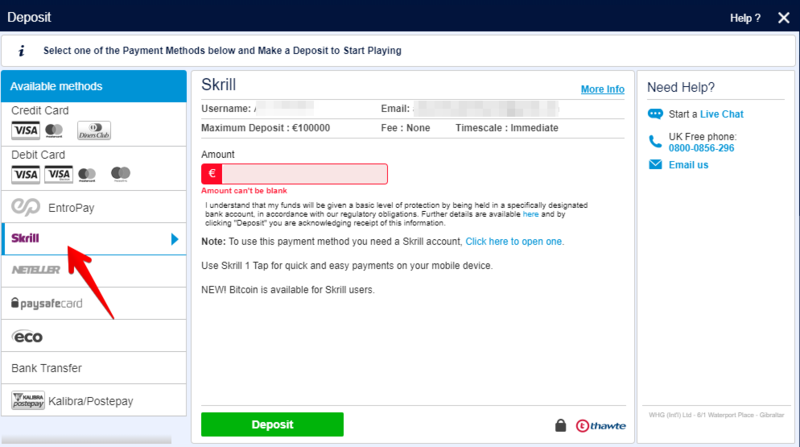 As previously mentioned, Skrill is one of the most-used deposit and withdrawal methods by punters. There are several reasons why they prefer to use Skrill. The most frequently mentioned ones are the speed at which the betting sites pay the withdrawals, as well as how fast you can deposit. The fact that Skrill doesn’t have a fee for your withdrawals is another incentive to turn it into your preferred betting payment method. To help you make a more precise idea regarding the deposit and withdrawal times, fees or limits, we prepared two tables with data from the top 3 betting sites in the UK. Even though most online wallets are available from a mobile device as well, Skrill took the customer experience to the next level. They developed the Skrill 1-Tap, a dedicated version of Skrill for mobile users. It is a single‐click payment service which enables you to authorise transactions automatically. Thanks to Skrill 1-Tap you will not be asked for additional authorisation every time you want to make a deposit. Each one of the presented options has their pros and cons. For example, you can’t use Paysafe for withdrawals. Neteller can’t be accessed in certain countries, while PayPal might come with fees when you receive money. Sure, an alternative to Skrill is the credit or debit card as well, however, you will have to face a withdrawal processing time of up to 3 business days. Funding your Skrill can be made directly through your bank account, a debit card or other means such as Paysafe, Neteller or even Bitcoin. Before you can add funds through either of these options, you need to add them as deposit options and verify them as well. Can You Transfer Money from PayPal to Skrill? 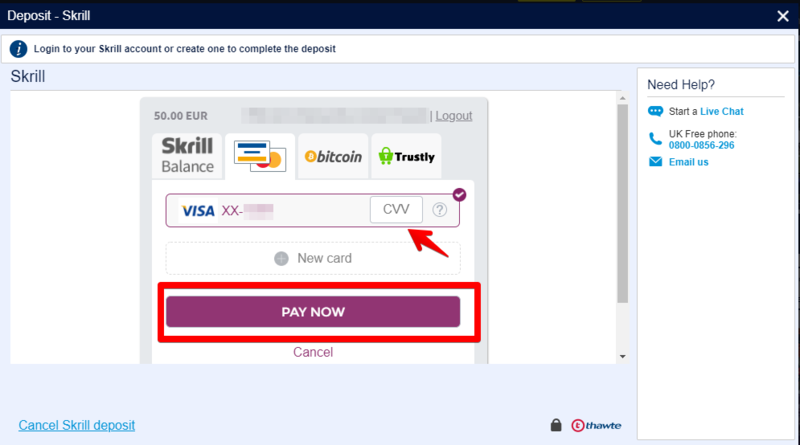 Can You Transfer Money from Neteller to Skrill? This operation is allowed by Skrill, and you can directly fund your Skrill account from Neteller. Keep in mind that there’s a 3% fee that is applied when uploading funds from Neteller into your Skrill account. They have a lower fee, of only 1.9% when you use your card to top-up Skrill. How Long Does It Take to Transfer Money from Skrill to my Card or Bank Account? Since both operations involve the bank that issued the card, the amount of time can differ from bank to bank. However, a standard time for the money to reach your bank account after a transfer from Skrill is three business days. What should you know about Skrill?